Brazilian winger Marcelo Dias lines up a shot against Tarxien. Tarxien Rainbows and Hibernians shared spoils in a 2-2 draw which satisfied neither side. The Rainbows remain in the play-off spot with 22 points, three adrift of Naxxar Lions and one behind St Andrews, whom they will face next weekend. On the other hand, Hibernians’s hopes of finishing fourth were dented as they remain joint-sixth with Floriana, within touching distance of Birkirkara but next weekend they face title hopefuls Balzan. It was Tarxien Rainbows who drew first blood. Boubacar Traore rushed all the way on the right flank before setting up Samba Tounkara who, unmarked in the box, hit a first-timer which hit the base of the net for 1-0. Hibs managed to find a way to restore parity when they were awarded a penalty after Marcelo Dias was tripped by Ebiabowei Baker in the box. From the spot, Clayton Failla sent Andrea Cassar the wrong way to level terms for Hibernians. 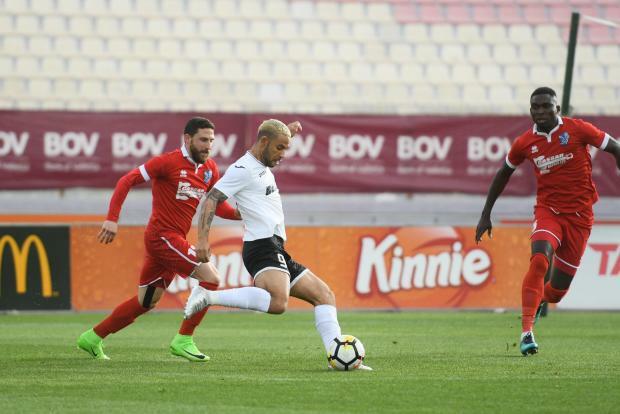 Tarxien struck late in the game when Tounkara left his marker on his spot before finding Ricardo Faria in the box who capitalised on his cross to put the Rainbows ahead. Nonetheless, Muscat’s clan managed to claim a point from this game when young Degabriele fired a missile straight into Cassar’s net for his 11th goal of the season. BOV Player of the match Andrea Cassar (Tarxien Rainbows).